I prepare trend reports for fortune 1000 companies. stuck in the cultural crosshairs. sharing the bone marrow with clandestine video game maker. using fire to cut hair. to get juiced in school. and leave it smoking in the pan. can be divided into stages, phases, trends, fads, and crazes. services provided by an eco-terrorist graffiti artist specializing in revitalizing heavy metal. as they get addicted to death and keep whoring for more. What’s hot, what’s right, what’s not in the spotlight? Hold a focus group and retool, train the pilots to tame the planes and get ready for a midair refuel. Do kids really think black is the new brown? or is platinum the new black? Who do we assassinate, and what era is ripe for a comeback? Do you trust me to keep the world on track? Over the weekend, James Duthie posted an excellent piece entitled ‘Twitter whoring goes mainstream” – a brilliant rant about singer John Mayer plugging products via his twitter stream. This sort of behaviour, ladies and gentlemen, is why I worry about the future or Twitter, and any social network that becomes too popular. The myth of Clean coal (Possibly the oxymoron of all oxymorons in today’s vernacular) has been suitably de-mythed by the Coen Brothers, in this wonderful little parody. The ad was commisioned by the Reality Coalition, a non-profit group dedicated to challenging completely rubbish notion that coal can be clean. This is fairly interesting. Skittles have changed their homepage to a link to a Twitter Search on Skittles. durbin : has anyone else heard about the skittles salmonella outbreak? be careful tasting the rainbow, its deadly. emilychang : watching the tweets about skittles coming in and LMAO. the backlash has already begun. geek irony rules. To be honest, I’m not really sure what to make of this tactic. It will definitely create a bit of cheap PR for them, as media and bloggers alike talk about it. And then it will probably fizzle into nothing. But that’s not necessarily a bad thing. At least they’re having a crack, I guess. I think Adobe are definitely onto something with their ‘Layer Tennis‘ championship. Two artists or designers battle out their skills by swapping a Photoshop file back a forth, adding to each other’s work in real time. Each competitor gets fifteen minutes to “volley” the file, and each volley is posted on the site. The matches last for ten volleys and when it’s complete, everyone with an opinion sounds off in the Forums and then they declare a winner. A third participant, a writer, provides play-by-play commentary on the action, as it happens. Seems as though they have some high calibre creatives going head to head. This week’s battle was Skinnycorp’s Jeffrey Kalmikoff up against interactive designer Brendan Dawes – and special comments by daringfireball’s John Gruber. What a great campaign – Artists inspired by other artists, in a format that you can easily digest. And spread to other artists. It reminds me of a simple thought that Andy Sernovitz spoke about recently – If you want your marketing to get spread by word-of-mouth, it can’t be about You. It’s about them. It’s not your company, your product, or your message. It’s about theirs. That’s why this campaign has already proven to be a word-of-mouth winner. What I also love about this type of marketing is that it doesn’t smell like a marketing campaign. It’s fun, not corporate. It’s like something you’d expect from Crumpler. It’s great. And it doesn’t leave you feeling as though you’ve been marketed to. 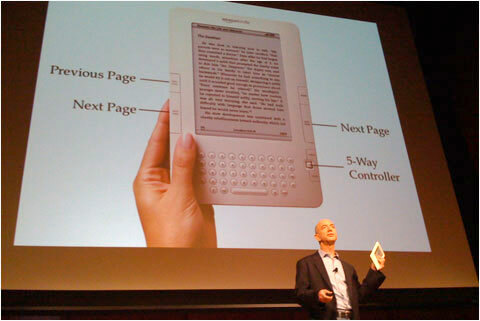 There’s lots of talk on the internets at the moment about the launch of Amazon’s e-book reader, Kindle 2. Kind of makes everyone else’s company visions seem rather crap, doesn’t it? I’ve confessed my love for Freitag several times before. They’re one of the first true green companies I stumbled across, and their messenger bags made from used truck tarps, seat belts and bicycle inner tubes are rad, gnarly and awesome. We‘re honered to announce that you soon will be proud F97 WILLY owner. We do everything within and beyond our power to make sure that in no time a charming delivery man will ring your bell to hand over your personal piece of FREITAG! Later this evening we‘re going to celebrate your shopping skills till dawn and we will drink at least 17 times to you. Therefore again, thank you very much! Finally!! Your F-product has been successfully packed and is now about to leave our F-factory. We all gathered one last time in the factory hall to wave goodbye with scattered emotions. We wish you and your FREITAG‘s the best of health in future. May you live in harmonic and eternal friendship! Once again, thanks heaps and we‘d love to welcome you back soon in our online store. Both these emails made me smile. It goes to show that it doesn’t have to cost anything to building loyalty with your customers.